I know exactly what it is like to be far away from family and friends over the holidays. For the past five years, I’ve stayed in Nova Scotia while my entire family was in Ontario. We didn’t want to drive the 20+ hours in winter weather – expensive and possibly dangerous with treacherous highway conditions. I relied on technology to talk to my family and wish them a Merry Christmas. WIND Mobile recently commissioned a survey and discovered that over 74% of Canadians said it was important to stay connected during the holiday season and one in two said that they rely on their mobile devices to do so. I know I would be lost without my phone. I don’t leave home without it and it’s my main way to connect with my family and friends either through text messages, social media or Skype. I recently learned about Wind Mobile’s new Cross-Canada plan and was impressed by the freedom it offers at an affordable price. The features that stand out most to me are the Unlimited Data, Unlimited Canada/US-wide Talk, Unlimited Global Texts and of course, the price of $44/month. There’s a reason they call it their best plan ever. Check out the details of the Cross-Canada plan and see for yourself. Relationship expert, Kimberly Moffit, has some tips on how to stay connected with family and friends over the holidays when distance is a factor. 1. Make Board Games Digital – You may have grown up playing board games with your family in front of a fireplace, but what to do when everyone lives across the country? Try different activities that can be done online like putting together a family album over Flickr or playing video “board games” like online Word Feud. You can even play remote games on systems such as Xbox Live. Playing games as a family is fun and can increase your sense of closeness during the holidays. 2. Skype, Text and Call to Your Heart’s Content: Just Make Sure You Have a Plan – Nothing’s worse than coming home to an overpriced phone bill in the New Year. Get a great plan this holiday so you can feel comfortable knowing that you’re spending quality time without breaking the bank. For example, WIND Mobile has a Cross-Canada plan that gives you the freedom to use your phone and stay connected across the country. 3. Write Homemade Christmas Cards – In our digital age of phones and email, there’s something to be said about being on the receiving end of a non-digital form of communication. Hand writing a letter or card might take time but makes a lasting and heart felt impression. 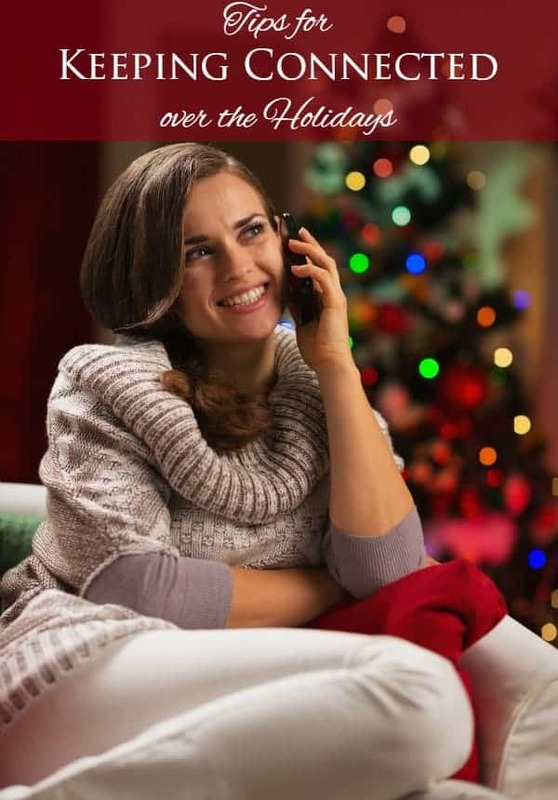 Having a good phone plan is a must especially over the holidays! You don’t want to get a surprise bill in January. The holidays are about connecting and sharing. Talk to family and friends without worrying about the costs and share away on social media. Your loved ones are only a phone call, tweet, or Facebook message away. How do you keep connected with family over the holidays? Connect with WIND Mobile on Twitter and Facebook. Excellent tips and I have to use skype more! These are great tips. My husband and I Skype all the time because he is in Honduras and I am in the US. I will be so happy when we can be together again. These are some really great tips–I wish I could get skype to work on my computer. Some wonderful tips! We facetime/skype with our college girl a lot. I love the idea of playing games with family across the country. We always do a little skyping over the holidays too. And I write cards… I just often forget to send them! I should send mine tomorrow before mail pick-up! We even included family photos in our cards this year. Great tips for staying connected! Great tips, I have never used Skype but it might be something I will have to check out after the holidays. My family is all here so no worries there. By the way, maybe I will run into you at the mall sometime. 🙂 Welcome back. Keeping in touch is so very important. I’ve used cassette tapes over the years. I live in Ontario and my mom and brother live in Alberta. It is especially hard during the holidays.